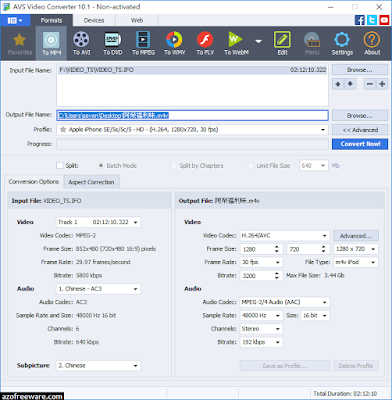 AVS Video Converter - Convert to/ from video formats: MP4 DVD AVI WMV MOV MPEG VOB HD FLV MPG MKV MTS etc. All key formats are supported. Write: HD Video (inc. Blu-ray video, MPEG-2 HD and WMV HD), AVI (DivX, Xvid, etc. ), MP4 (inc., Apple iPhone, iPad, iPod, Samsung Galaxy and Sony PSP), WMV, 3GP, 3G2, QuickTime (MOV, QT), SWF, FLV, F4V, DVD, MPEG-1, 2, 4, MPG, MJPEG, H.263, H.264, MKV, MPEG1 DPG, AMV, MTV, GIF, TS, M2TS.